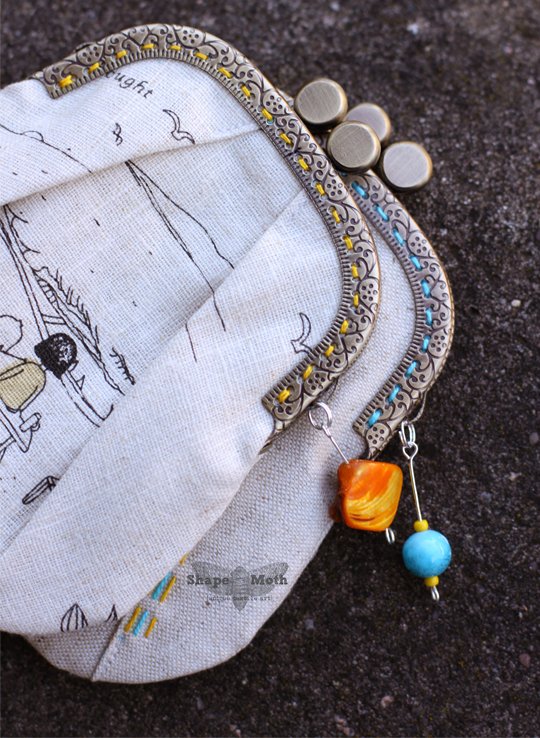 Welcome to my stop on the Zakka Style Sew Along! You can find all the details about this SAL in THIS post. I was very happy when I was asked to join the sew along and was assigned to make the Pleated Coine Purse, designed by Karyn Valino. Dzis moja kolej w Zakka Style Sew Along. O szczegolach tego SAL pisalam w TYM poscie. 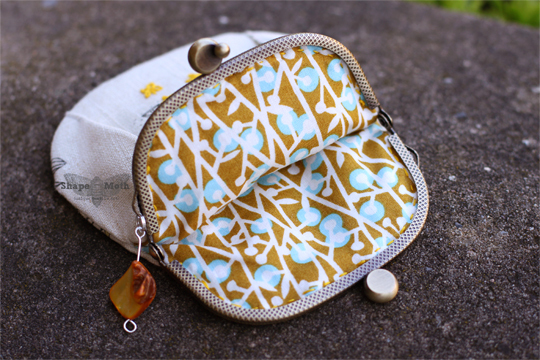 For both purses' intreriors I used aqua/mustard fabrics from Cut out and Keep collection by Cloud 9 (I think that's my all-time favourite fabric collection). Making the purse was fast (excluding the time needed to adjust the pattern to my needs), fun and easy. The pattern gives lots of opportunities (you can fold the pleats differently, add some fancy purse frame, embelish the purse), but I'd say the instructions in the book fit more to those, who have a bit of experience with sewing purses with metal frames. If I would be a beginner, I would have difficulties to make it relying only on the instructions in the book, as there were no pictures/illustrations of the sewing process. Just plain text. W obu portmonetkach na podszewki uzylam materialow z kolekcji Cut out and Keep zaprojektowanych przez Cloud 9. Portmonetki szylo sie szybko, a wzor mozna dopasowac i interpretowac w zaleznosci od potrzeb, tylko opis szycia byl malo szczegolowy. Mysle, ze dla kogos, kto ma juz doswiadczenie w szyciu portmonetek z biglem to nie bedzie sprawialo najmniejszych problemow (bo i bez opisu mozna uszyc) ale dla poczatkujacych, brak jakichkolwiek ilustracji z procesu szycia moze byc utrudnieniem (jest tylko tekst). If you make a Pleated Coin Purse -- or any of the projects from Zakka Style -- I'd love to see it. Join the Zakka Style Sew Along Flickr group to share your finished projects and to get a chance on winning some fabulous prizes! Lindsey from LRstitched has rounded up 24 fantastic prizes from some of the biggest brands in the quilting industry, and she's giving them away on her blog to people who are sewing along with us. Be sure to check out LRstitched to stay up to date on all of her active giveaways. I've also got 5 sampler packs of Aurifil thread to give away. All you need to do is to write a comment under this post and tell me the title of your favourite quilt/sewing book. I will randomly draw 5 winners on 3rd of September. Remember, if you are a non-reply blogger, I will not have a chance to contact you. Ja tez mam dla was niespodzianke. Mam do rozdania 5 malych zestawow nici Aurifil. Jedyne, co musicie zrobic, to napisac komentarz pod tym postem i napisac tytul waszej ulubionej ksiazki zwiazanej z szyciem lub patchworkiem. Pieciu zwyciezcow rozlosuje 3go wrzesnia. Pamietajcie, ze musze miec mozliwosc skontaktowania sie z wami przez e-mail. Bigle,które udało Ci się kupić dają niesamowity efekt. Przykuły moją uwagę jeszcze zanim przeczytałam treść Twojego posta. Przyznam szczerze,że nie korzystam z książek o szyciu,a jedynie prenumeruję czasopisma. Kiedyś dostałam w prezencie książkę "Patchwork dla ambitnych",ale z niej nie korzystam. Książka jest o podstawach,które dawno już mam za sobą:) Pozdrawiam ciepło!!!! Thanks for an honest review of this project! I don't have any sewing books except The Zakka style. I learned about this SAL on your blog and so far I made all the projects. Thanks for that it's fun. Your purses are lovely! Love your two little purses. All the details make them unique and so Zakka. I turned mine into a pouch as I couldn't get the frame to fit either. I love your coin purses! They are lovely. Right now my favorite quilt title is modern blocks,but I have so many others that I love as well. Thanks for the giveaway. That linen print is so sweet. Love the embroidery details too. wow, your little purses are certainly inspiring!! Just darling! I am kind of scared of this project, so will be looking for some tutes with pics to help me along...I hope. btw, my current fav quilting book is Quilting Modern. beautiful work! i think i might just give it a go! may favorite book right now is One Yard Wonders. thanks! Your purses are super - I too am a bit hesitant on this one as I bought a frame a few weeks ago that is not the right size and hoping to adapt the pattern. I seem to have been joined at the hip to my Zakka book to think of any others for a while. Your fabric choices and embellishments are so great! I haven't started mine yet, but I am inspired by yours! I think my favorite sewing book is The Bag Making Bible by Lisa Lam. Those are so precious! Love how you embellish them, and I love the contrast between the linen and the bright cotton lining. I still have not found those clasps around my neck of the woods either, but I should really dig more. Would love to make one. Thank you for the inspiration. Regarding a book... hard. I went through Dancing with Thread by Ann Fahl. It is very specific to free motion quilting, but I found it inspiring and enjoyed reading her story. It is not a project kind of book though, but a more informative and educational type book. These are so, so lovely! My favorite quilt book is on my wishlist until it is released in the USA...Everything Patchwork. Truthfully I've enjoyed all of the things I've made from Zakka Style, too! I would have to say my favorite quilt book so far is the Zakka because its the first Quilt I made from instructions. Ha! I have ordered Modern Quilting and a few others, but right now I have to rely on tutorials with pictures and discussions. Wszystko co uszyjesz zawsze jest piękne i dopracowane w każdym detalu! Bardzo podobają mi się detale Twoich portmonetek (i ściegi ręczne i wisiorki). Moja ulubiona książka o szyciu to Playful Patchwork autorstwa Suzuko Koseki. Następne w kolejności książki są również albo autorstwa SK albo japońskich autorów. The coin purses are beautiful! Wonderful details!! I only have a few quilt books, but my favorite is "Quilts from The Quiltmaker's Gift". Thanks for the chance to win! Your purse is a darling. My first and only quilt book is 'Simplify' by Camille Roskelley. I love them. I just started getting interested in quilting and would love to continue learning. I'm scared of this project!! I have so many books, this is a tough question. I'd say Sew Pretty Homestyle as it's real eye candy! 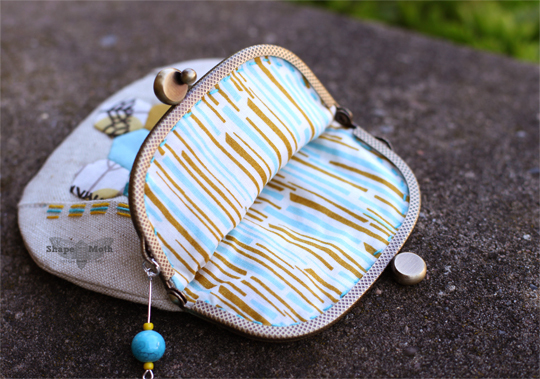 Your version of the coin purses are fabulous! Love them!!! I have so many good quilting books, but at this moment I like most Fat Quartely's Shape Workshop for Quilters book. Your little frame purses are so very cute. So much detail in such a small project. Very inspiring. This might not sound original, but I really think this Zakka book has been my favorite book until now. It has been so inspiring to me. I never knew I had certain skills in me. Not that I always found the descriptions of the patterns good, but it is great to find solutions my own way and make the projects my own. Thank you for the chance to win a sampler of the Aurifil thread. My favorite sewing book is definitely Zakka Style -- so many great ideas in one volume. Joanna, your purses are just divine...they each have so much soul. Beautiful. That print is adorable!! My fave sewing book is Anna Maria Horner's Handmade Beginnings. Ooooh, your purses turned out gorgeous! Thanks for sharing your insights about this project. You've given me inspiration to try it! My favorite quilting book is The Gentle Art of Quilt Making by Jane Brocket; Zakka Style is a very close 2nd! Love, love your purses - must make me one (or a few!) for the holidays. Thanks so much! I love those little purses! So far I like the Zakka book...I haven't used a lot of books yet. I'm looking for a useful one! mine is elizabeth hartman's new book...and her old book too! Current favorite is Stop, Go, Quilt, Sew. 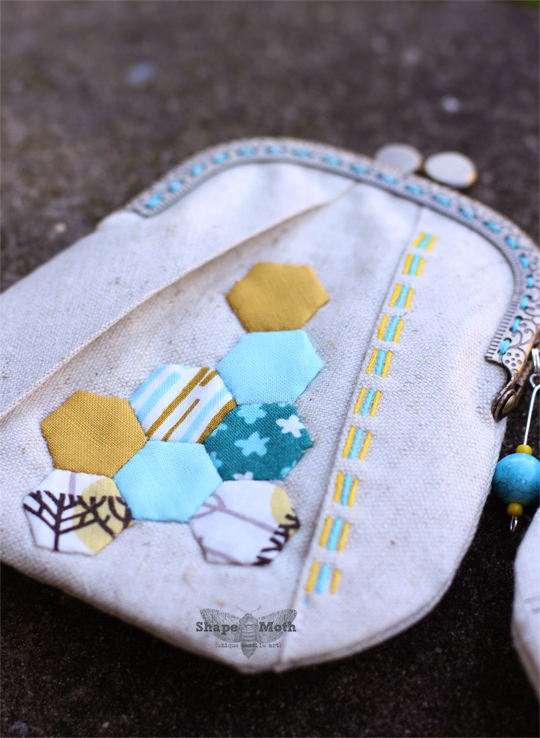 My favorite quilting book at the moment is the Fat Quarterly Shape workshop for quilters but I just wanted to say ooh I've never seen a close of of a stitched on purse frame before, and that looks just fabulous stitched on! I need to shop for some frames like that! Those little coin purses are so cute ~ I'm going to have to find frames and make one! I have a bunch of sewing/quilting books and it's so hard to know which to choose. Zakka Style is one I've used over and over again for myself and to make gifts. Also have Quilting Modern by Jacquie Gering and Katie Pedersen ~ it's a great book with lots of lovely quilts to make. These little purses are SO sweet! I'm a newish quilter and have only used one book so far and that's Simplify by Camille Roskelley. I'm on my 2nd quilt using instructions from that book and I'm finding it easy to follow with helpful tips. Your purses are lovely. I have to skip this project. I don't have the frame. The Zakka Style Book is my favorite sewing book! These are so sweet! I'm a quilter, but, love to see what other creative folks are doing. My current favorite is One Block Wonders Encore. Thanks for the chance. That coin purse is adorable. My youngest daughter Emma would love it, she loves all types of purses anyway and this would work great for her to take to school. Thanks for sharing your wonderful talent. My favorite quilt book is Quilt In A Day- Logcabin by Eleanor Burns. 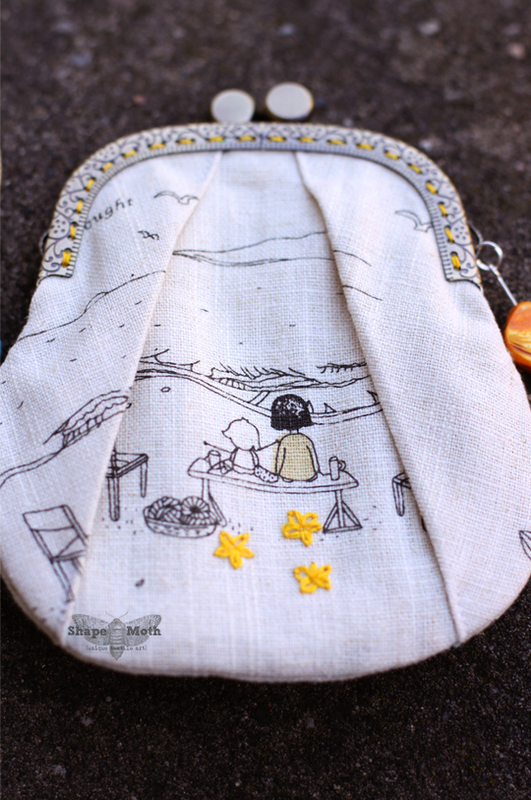 Your coin purses are wonderful, the details just make them. The quilt book that started me off was Simplify by Camille Roskelley and it's the one I've gone back to several times for advice, but the Zakka book has definitely made me try lots of different things. I love elizabeth hartman's 'the practical guide to patchwork' for modern inspiration - but it's really hard to just choose one! my "favorite" is always my newest.......lol. but my "go to" book is 501 quilt block patterns. love this little coin purse. i HAVE to find some of those frames. 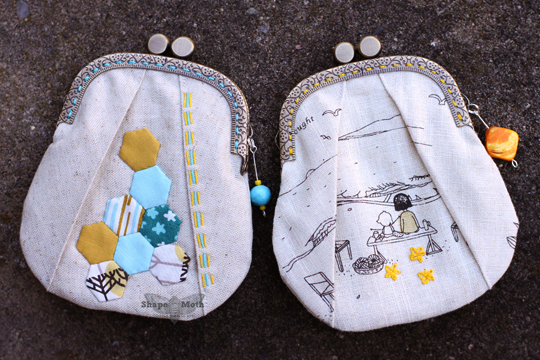 I love both of your coin purses, but I think the hexie would be my favorite! Portmonetki piękne.Cudne bigle z przeszyciami, utrzymują materiał, ekstra. Both coin purses are wonderful. The linen makes them look so special. I haven't tried a sew in frame yet, but it looks so nice! I recently purchased Quilting Modern and can hardly wait to get started on a project from it! Pickig a favorite out of all my children--what a question! I love my Mimi Dietrich applique books and my Nancy Zieman's sewing books and anything involving a needle and thread. About the book, I don't own it but I saw a preview in amazon.com and would love to own and recommend "Free-Motion Quilting with Angela Walters". Your coin purses are very cute. My favorite book right now is The Art of Machine Piecing by Sally Collins. I'm trying to improve my piecing skills. Right now my favourite quilty book is Modern Blocks/99. I'm in several bees so it has been very useful to pick a block from that :) Super projects - love the yellow stitching!!! Thanks for the honest feedback about the process...I have enjoyed the Zakka Style book for the projects but do wish it had more illustrations and less mistakes. Your purses are totally divine . I really want to make this ,but now I'm so scared . What a pity the pattern and frame don't match up because I bought a whole lot of the frames a while ago on sale for this project. I love my patchwork books but my two new ones are Modern patchwork by Elizabeth Hartman , beautiful quilts and such good instructions , my other new book is Angela Walters Free motion quilting book . Also very good . Readers Digest Complete Guide to Needlework. It's my reminder book when I forget how a stitch works.